Welcome to the April issue! Spring has arrived! Here in Tucson, the Sonoran Desert is in bloom. If you aren’t yet enjoying the warmer temperatures and the colors of the season, I hope you will soon. This month, I’ll share some kind words a recent client sent to me, as well as some interesting info on the benefits of sharing family stories. If you watch too much Home & Garden Television (HGTV) like I do, you’re well familiar with the “reveal.” This is where the designer ushers his/her clients (usually the clients have their eyes closed) into their newly redesigned/rebuilt room or space, asks them to open their eyes, and then enjoys their reactions. As a video biographer and personal historian with clients spread throughout the U.S., I’m not often able to be present when a completed legacy video is “revealed” for the first time. But I do enjoy the feedback from my clients and storytellers and find it quite fulfilling. My Family Legacy Video® is perhaps the most valuable possession I will ever own. It is an irreplaceable treasure for my children, my children’s children. In his video, my father speaks with candor and clarity for two hours about his life, telling stories I’ve never heard before and will treasure forever. I am touched beyond explanation for the gift Steve Pender has given us. My dad is the most beautiful man, and this heartfelt interview, woven exquisitely, makes my heart sing with joy and gratitude for our Family Legacy Video® of the man who will always be my Daddy. Wow – it sure doesn’t get any better than that. 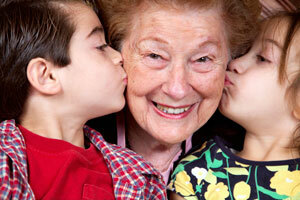 Studies show children & elders benefit from sharing family stories. One of the things that motivates folks to create a video biography is to leave behind a legacy of life stories for the enjoyment of their children, grandchildren and generations yet unborn. But academic research is showing that kids get more than just fun out of learning family stories. “Family stories provide a sense of identity through time, and help children understand who they are in the world,” researchers at Emory College in Atlanta, Georgia, wrote in their 2010 paper: Do You Know? The power of family history in adolescent identity and well-being. For years, researchers have theorized that family stories are a critical part of adolescents’ emerging identity and well-being, but they haven’t been able to measure how much kids know about their family history and intergenerational family stories. For their study, Emory psychologists Robyn Fivush and Marshall Duke, and former Emory graduate student Jennifer Bohanek, of the Emory Center for Myth and Ritual in American Life, developed a “Do You Know” (DYK) scale to try to measure kids’ knowledge of of their family history. The DYK scale featured 20 yes/no questions asking children to report if they know such things as how their parents met, or where they grew up and went to school. Sixty-six middle-class, mixed-race, 14 to 16 year-old adolescents from two-parent families completed the DYK scale, as well as multiple standardized measures of family functioning, identity development and well-being. Teens who knew more stories about their extended family showed “higher levels of emotional well-being, and also higher levels of identity achievement, even when controlling for general level of family functioning,” the study found. “There is something powerful about actually knowing these stories,” the study said. When a grandparent shares a story about becoming a U.S. Navy pilot after being turned down on his first try, it helps convey the importance of perseverance, or when a favorite aunt tells about moving to New York to find a job at age 18, it demonstrates taking chances, Gladding said. Telling stories that highlight older relatives making their mark can reinforce older adults’ self-worth, while also inspiring younger family members, said Gladding. Sounds like researchers are telling us that preserving, sharing and celebrating life stories is a win-win for all involved.